Villas Del Mar 3BR/2BA Penthouse on RIGHT ON BEACHFRONT! UNBEATABLE BEACH VIEW! Property 6: Villas Del Mar 3BR/2BA Penthouse on RIGHT ON BEACHFRONT! UNBEATABLE BEACH VIEW! Property 7: Paradise Suite apt 9 Ocean Views/ Free Wi Fi/ Steps to the Ocean. Apartment - Spectacular Ocean view with 2 mins walking distance to Coral beach. 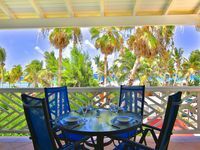 Property 24: Apartment - Spectacular Ocean view with 2 mins walking distance to Coral beach. Bayfront Oasis in Old San Juan's safest neighborhood! Property 29: Bayfront Oasis in Old San Juan's safest neighborhood! Property 31: Upstairs One Bedroom Apartment- with beautiful waterfront views! avDirectly on Isla Verde Beach, Overlooking the Ocean. Property 46: avDirectly on Isla Verde Beach, Overlooking the Ocean. In April 2019, the unit renovations are marvelous, the building itself is still under repair. We woke to the sound of working at 730-8 am every weekday. Workers were very nice and tried to work with us. It MUST be stated that this is a THIRD floor unit, with the main bedroom in the loft. The pull out couch on the main floor was very comfortable though! We didn't use the main bedroom, as it was upstairs with no bathroom on that floor. We found the AC to be a little underwhelming (in US sense), we relied on the ocean breeze, an open sliding door and two windows to provide cooling. The appliances were fine. Enough plates and cookware to have a small meal. The main draw is the village directly across the street, 7-8 different restaurants, from dive bar to fine French and Italian menus. You DONT HAVE to drive anywhere if you don't want to. There are also 2-3 mini-grocery stores at you feet as well. Beach within 50 meters. In April 2019, no sign of the pool. Didn't see it.